The schedule is still being worked on, but this is a tentative schedule of activities. Wednesday, August 15: Travel day with a Meet and Greet Social in the evening to visit with old friends and welcome new friends to the FSSF family. Included will be light hors d'oeuvres and a cash bar. Special Service Force in the afternoon with very informative and interesting documentaries about the FSSF. Some free time will be available in the early evening to take in the sites and get dinner. There will be a social gathering in the evening. Friday, August 17: Starting with a continental breakfast, the morning is open time to spend with friends, to see the sights of Moncton, or you can also visit the Kit Shop. Throughout the afternoon at the hotel we’ll be presenting various documentaries and sessions about the FSSF. Banquet seating sign up will be available in the evening followed by a free night. Saturday, August 18: Following a continental breakfast, the Memorial Service will be held in the morning at Victoria Park. 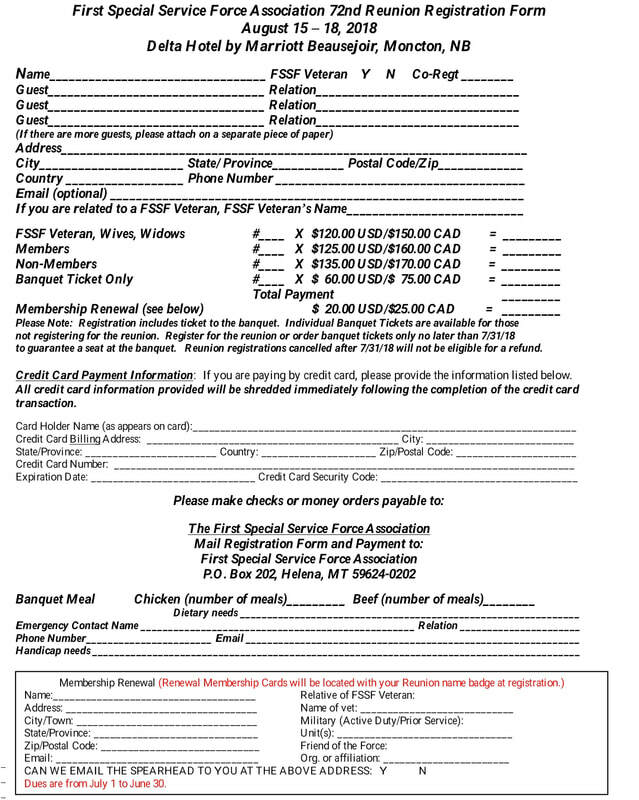 After the Memorial service, buses will take attendees to the Royal Canadian Legion Branch #6 for a light luncheon. There will be some free time in the afternoon to rest and relax. A cocktail hour will be held with the FSSF Banquet being held this evening in the hotel’s ballroom. plan to stay Saturday night at your hotel. We are looking forward to seeing you all again. Let's make this a great reunion! !